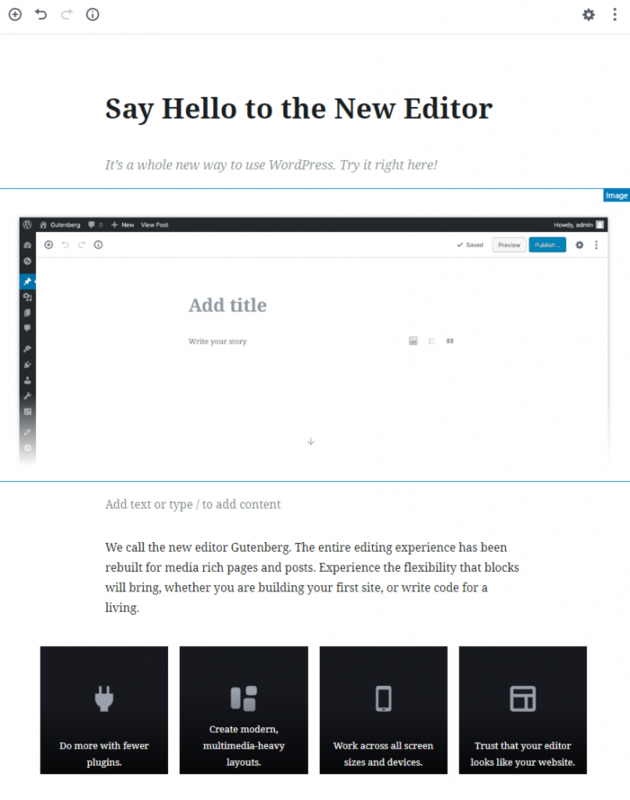 If you’ve been following anything about WordPress lately, you might have heard about the new major update of WordPress coming later this year, which includes a fresh face for the WordPress editor — yep, they’re also making the move towards the visual builder trend as well taking everything by storm. It will come with the core files as default, though if you enjoyed the current/classic editor, you’ll need to download the plugin that will restore it. Instead of having to type your text in and use a mix of code, other plugins, shortcodes, and the preview button to hope that what you want your content to turn out as is what visitors to see, they instead aim to make the visual editor more of a WYSIWYG (What you see is what you get) through the use of content blocks and native columns that are response. You still get your normal editor elements including paragraphs, headings, quotes, images, videos, and lists — but it also includes the ability to drop in files, audio, cover images and buttons without the need of code. You can also easily style columns as needed to better organize your content. You can easily rearrange the order of your content as well by click and drag functionality, letting you swap images and paragraphs fairly quickly. Another great thing ? Totally responsive, so it means you can update on the go on your tablet or smartphone. Honestly, I wouldn’t do anything beyond simple text edits on your phone in Gutenberg, but it’s reassuring to know that the option is there. In my opinion, Gutenberg has it’s pros and cons — For blog posts, and websites that don’t require complex themes and functionality, there’s a good chance that it could replace a number of page builder themes and plugins that are bloated with too many extra features that you likely would never used. On the other hand, it may be a bit too simple for those experienced with developing WordPress themes; however, once you have the major part of the site done, this may be a good way to hand off the reigns to everyday users once they get past the minor learning curve. It’s still going to go through the rough patch of dealing with incompatibility with a number of plugins that rely on the old format of the edit page, but I think as time passes that will no longer become a problem. As mentioned before, once the new WordPress Core update comes out, it’s not an optional feature — it will replace the classic editor, but there will be the ability to download the “classic editor” to replace it in a bandage manner. Curious about testing it out without downloading the preview plugin to your own website, before WordPress 5.0 comes out? Visit https://wordpress.org/gutenberg/ where you can play around with the editor without logging in.